Telangana TS SET result 2018 result: The results of Telangana State Eligibility Test (TS SET) has been declared by the Osmania University on the official website. The examination was conducted on July 15, 2018. Candidates who had appeared for the same can now download the results and answer keys from telanganaset.org. 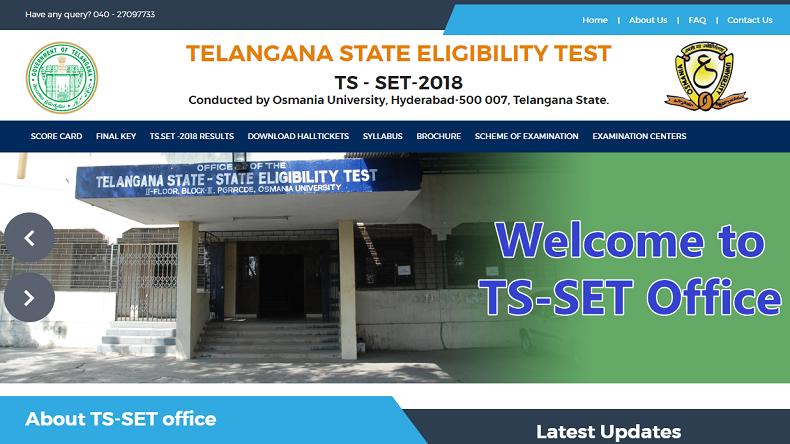 Telangana TS SET result 2018 result: The Osmania University has released the result of Telangana State Eligibility Test (TS SET) on Friday, September 7, 2018 on its official website – http://www.telanganaset.org. The University had conducted the State Eligibility Test on July 15 for candidates aspiring to become a Lecturer in colleges. According to media reports, around 50 thousand candidates had appeared in the examination this year. The answer key of the TS SET 2018 exam has also been published on the official website. candidates can even tally their attempted answers in the exam, which was held for 29 subjects and one common paper. The exam started at 10 am and went on until 1:15 pm on the scheduled date. The examination was conducted by the university on behalf of the Telangana State Council of Higher Education Office.